Have you ever woke up and realized your pillow is in a very strange place? You had a peaceful night but still your pillow is in the strangest and weirdest position ever. Or you wake up, and you find yourself on the other side of the bed, completely disoriented! Even though you had a good sleep it happens to us all. 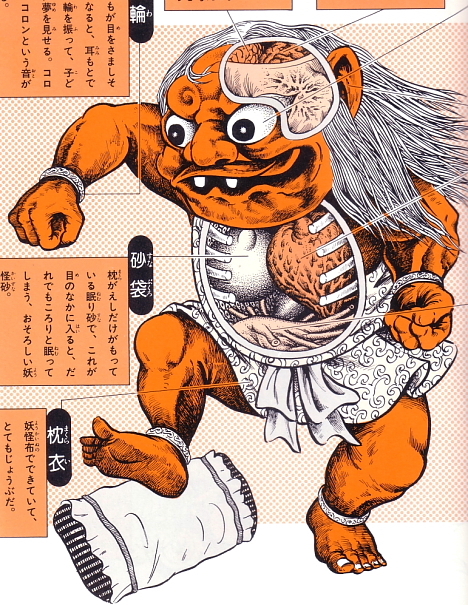 The Makura Gaeshi will creep up to people who are sleeping and turn their pillows around, or sometimes put it to their feet or even move their sleeping bodies, so they wake up with their heads where their feet were supposed to be. Another story says that a blind man that was murdered by an inn owner lingered on as a spirit in the room where the deed happened, and turned into a makura-kaeshi. If he actually turns the entire sleeper around, so that his head is where his feet were, this would not only be very amusing to the Makura Gaeshi, but also very chilling to the sleeper when he finally wakes up. In a book about Japanese ghosts, in a section regarding funeral customs, the Japanese (traditionally) only sleep facing south. Consequently, when someone dies, they are laid down with their head facing north. To wake up in a position normal only for a corpse would be unsettling indeed! As a Western parallel, it would be like waking up in a coffin. One story mentions a kappa that got a kick out of doing this. Then he got caught, repented and even put it down in writing that he'll never pull a trick like that again. And because he'd been so good, he turned into a zashiki-warashi, and apparently still tends to show up in a certain ryokan in Iwate province, in the town of Ninohe. Another story is about a jizō statue that moves peoples' pillows--if you sleep next to it with your feet towards it, you'll wake up to find the pillow next to your feet, closer to the statue. Along with the pillows of court ladies from Heian, the wooden neck stands that they placed their heads on in order not to mess up their hair while sleeping were also called makura. These wooden makura were often made with tiny little drawers, and the court ladies put their diaries in them, so nobody could read them while they were asleep. And since they put all of their most secret thoughts into those diaries, it's not difficult to see how that would lead to a belief that a person's soul rests in a pillow/makura while they are asleep. It would be a very scary to tell your kids. They would freak out if they ever see there pillow elsewhere! It does happen you wake up on the other side of the bed, and is does happen you find your pillow elsewhere. But is the Makura Gaeshi the reason?